It was ten years ago that I cut the cord on my previous life and went full time into being a Talker. At the time I was certain it was the thing to do. Today? It was absolutely the best thing to do! The ways it changed my life have been amazing and a blessing. The 2018 version of the annual “Only NCAA football game that actually matters” was fantastic. From the opening moments to the final note of the Army Alma Mater, the Army-Navy game was an awesome experience. Okay, Army won (two in a row, now), but as I have so often said, I can live with that. This game has so much more meaning than who scored more points. 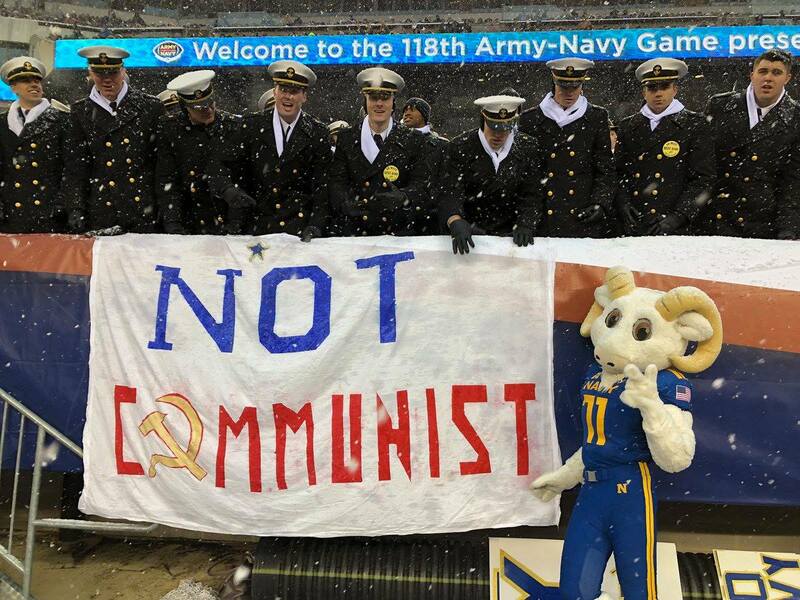 One of the more interesting things about this game is the inter-service rivalry and what we used to call “Spirit” but today is known as “trolling.” The best sign – in my humble opinion – was a Navy sign that took direct aim at a former Cadet’s political views, which he stated at his graduation and upset more than a few people. But it also raises questions about the 1st Amendment, Military Service and what kind of leaders we seem to be producing these days. The controversy over the Roy Moore Senate campaign just continues to grow. what happens this week will – without a doubt – cause even more Moore brouhaha. Theories abound as to what will happen and why. The bigger question is my mind is how we allowed ourselves to even get to this point. Roy Moore is not a sphinx, he is not a mystery wrapped in an enigma and smothered in secret sauce. His record and his beliefs are there for all of us to see. So while it’s up to Alabama voters to decide who will – at least for the moment – represent them in the US Senate, it might be a time for the rest of us to really think a bit about what it is exactly that we stand for? Donald Trumps plan to “ban all Muslims” is not just badly flawed, it also could lead to another national embarrassment like the one we had in 1975 when we abandoned the Hmong People in Vietnam. Like it or not, our military relies on Muslim folks to HELP us in our fight against ISIL. And Trumps plan would make getting that assistance virtually impossible. Meanwhile, Trump also promised the New England Police Union, people who are sworn to uphold and defend the Constitution, that he (Trump) would use the power of the pen to issue an Executive Order to bypass said Constitution that the Police Union promised to uphold and defend, to overrule state Laws and Constitution and execute Cop Killers. Instead of reacting as people who have sworn to uphold and defend the Constitution would have reacted, the New England Police Union cheered, applauded and endorsed Donald Trump. The day is almost here at last for the ONLY College football game that actually matters, Army-Navy 2015. All of the pageantry and on field performance is secondary to the idea that the men and women you see on Saturday, will, in just a few months or years, be leading our nations Military as we battle the evil in this world. And remember this – to the “experts” at ESPN, one particular player you will see on Saturday, “wasn’t good enough” to be invited to the presentation of the most meaningless trophy in sports, the Heisman Trophy, which is supposed to represent excellence AND integrity, but in fact, represents excellence in marketing.